Get your mind out of the gutter, YOU PEOPLE. Once the bird head was completed, I headed to creating the little finial piece that sits at the bottom end of the staff (and also acts as a handy counter-weight) that I have dubbed "The Strawberry". 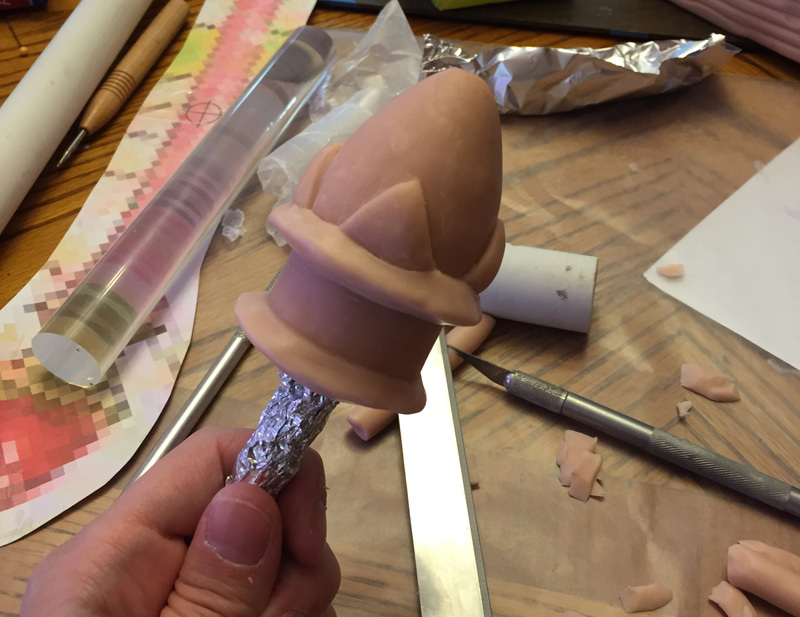 This part probably took the highest amount of sculpting out of the entire project, so if you're real great at sculpey clay, you might need to enlist a pal to help you out. Or just jump into it and LEARN! That's always a good option too! I recommend Super Sculpey because it's very durable and strong, and frankly I know I'm clumsy so I'd hate to have it shatter on me if I dropped it at a show! 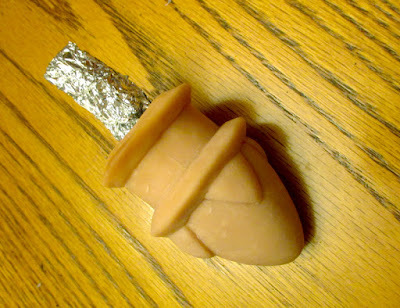 I started out with a tinfoil "core" I was going to put in the center of the strawberry, as well as have a tail of it that I can thread through the handle so it can be permanently glued in. Using my cut out diagram (See that thing in the upper left that's all pixely, YEP I'M STILL USING IT), I used it as a guide to determine how big the strawberry and bezel needed to be. I also had an extra bit of pipe left over I used as a guide on how big the hole of the finial needed to be (VERY HELPFUL THAT IS). And with that, I started to sculpt. I baked it multiple times, so that way I wouldn't damage other parts. 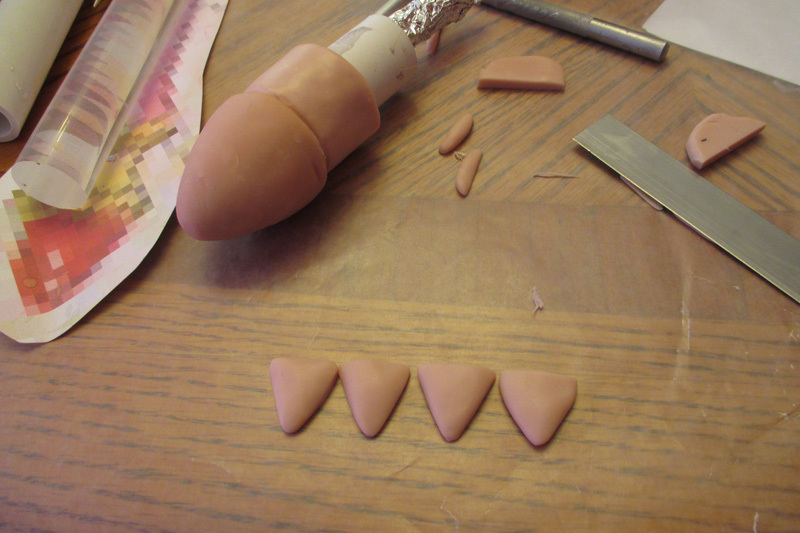 I started out by molding the strawberry shape, smoothing it, and baking it. After that, I added the base for the bezel, then baked that. Then I added the little triangle bevels - arranging them opposite each other on the strawberry. BAKE AGAIN. Last but not least, I made the outer ridges and baked the object for the last time, per instructions on the box. By baking it in sequence, you will have nice smooth surfaces that you don't have to worry about accidentally mushing it when molding other pieces! 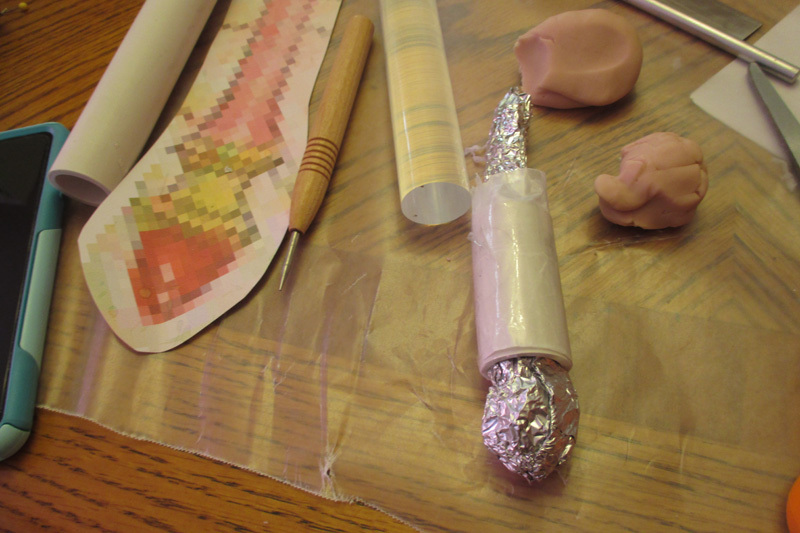 I folded over the tinfoil tail, and make sure it could fit into the PVC handle. Once I was happy with that, I applied a bunch of E6000 to the inside of the pipe and inside of the finial and glued that bad boy in, never to be removed again. NOW IT'S TIME TO FINISH THIS!